Anglerfish and Frogfish are very unique fish with an amazing ability to blend into their environment. Due to their highly predatory nature, they are often best kept alone, and for this reason are not seen in reef tanks, or tanks with small fish. However, if their needs are met and care is taken to avoid any tankmates small enough to be eaten, anglerfish/frogfish can make excellent pets. 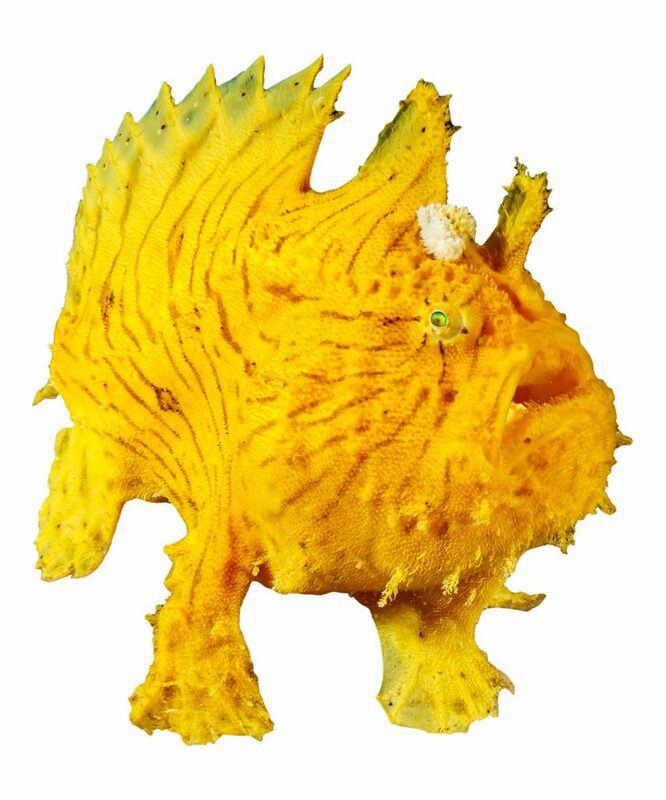 Anglerfish/frogfish are notable for the characteristic lure, or “illicium”. This fleshy growth is positioned on their head and used to lure unsuspecting prey items such as shrimps and small fish to within striking range. Another very fascinating aspect of anglerfish/frogfish biology is their strategy for reproduction. Many species exhibit extreme sexual dimorphism, with the males being significantly smaller than the females. In fact, in some deep-sea angler species the males will latch onto the female, and permanently fuse with her, living off of her energy reserves. The male angler is provided a constant supply of nutrients, and the female is provided a constant supply of sperm! Anglerfish/frogfish are in many ways the ideal marine aquarium fish. They are considered a very hardy, do not attain an overly large size, and require only a minimal territory. In the wild anglerfish and frogfish consume primarily live prey such as small fish or shrimps. When first introduced into captivity, it is often necessary to provide a supply of live food while weaning to frozen shrimp. Large, frozen mysis such as PE mysis make the ideal weaning diet. The large, whole mysis are readily recognized as food and the smell is highly attractive. Many species of anglerfish/frogfish do not require a very large tank. However, it is important to consider carefully what species may be best for you tank. While smaller species such as Antennarius maculatus are suited to smaller tanks, species such as Antennarius striatus may be better suited to a larger tank.